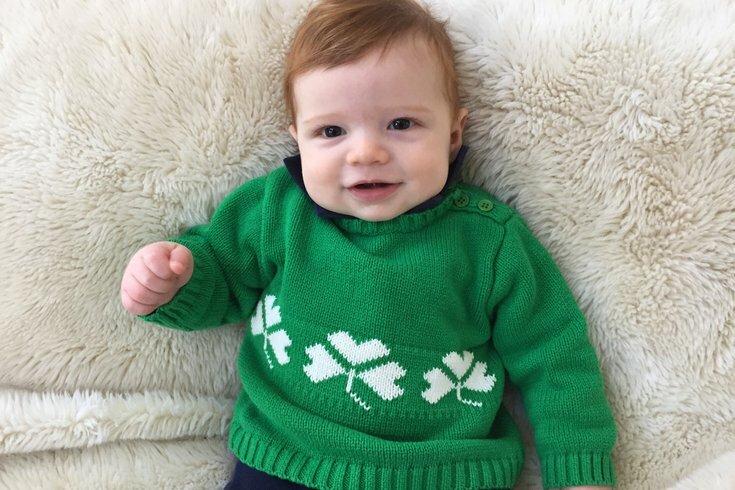 Katie's little lad, Killian, pictured wearing a sweater that his MomMom bought for him last summer in Ireland. St. Patrick’s Day is well-known in the United States as a day to party. Even though the elders of my Irish Catholic family would observe the Feast of St. Patrick by going to church, we of the younger generation have celebrated the patron saint of Ireland through pub crawls, parades, music and dancing. Once I turned 21, it felt wrong if I did anything other than visit half a dozen bars on March 17. As I grew out of my early 20s, I started going to Mass on St. Patrick’s Day before hitting the pubs. The only time I voluntarily go to church alone, attending the feast day Mass or simply lighting a candle in church on this holiday is a way for me to feel connected to my Irish relatives who have passed, especially my grandpa. Now that I am a mom, I wonder how should I celebrate St. Paddy’s with my son? Will I take him to church? Take him to a bar? Take him to the parade in New York City or Philadelphia? Dress him in green, make him corned beef and cabbage and teach him how to bake Irish soda bread? Like every holiday, I want to make it special for my baby boy. I also want to carry on family traditions and create new ones that he will look forward to annually. Like most things in life, I turn to my parents' example for guidance. Growing up, St. Patrick’s Day was a day to celebrate our Irish heritage and our big, awesome Irish family. My Catholic elementary school would recognize the feast of a holy saint and we would wear green. We would make birthday cards for our beloved Uncle Pat. My mom would talk about our Corcoran family and ancestors. It was a day of familial love and Irish pride. For St. Patrick’s Day this year, I am going to take my son to church and light a candle for my grandma and grandpa Corcoran. I am going to show Killian photos of his Irish relatives, talk to him about our Irish ancestry and play Irish music. I am going to Facetime with my dad so he can sing "Wild Rover" to his grandson. I am going to read my son a children’s book of Irish fairy tales and make my husband an untraditional corned beef dinner. Rather than a day to party, I am going to make my first St. Paddy’s Day as a mother a day of family love and Irish pride just as my mother did for me. My parents took us to Ireland last summer. It was a dream-come-true trip for my family. The stories and movies and books that I was exposed to as a child simply did not do this magical place justice. To be in Ireland with my family as I was pregnant with my baby boy was beyond incredible. It was life-changing: beautiful, emotional and so much fun. One day, my husband and I will take our son to the Emerald Isle and show him where his family is from. I look forward to giving the gift of Ireland to my baby boy, just as my parents did for us last summer. My son is a red-headed lad of Irish descent. We decided to name him Killian, derived from the Gaelic name Cillian, while sitting in a bar in Kinsale, County Cork. His Irish ancestry is already a part of his identity, but the love, respect and pride of our Irish family, heritage and culture are things that I will need to instill in him, just as my parents did with me. I think St. Patrick’s Day is the perfect opportunity to do this. How do you celebrate St. Paddy’s with your children? Share with me in the comments section below or tweet me @ThePhillyVoice and @KathleenEGagnon.